"Primorye is a territory of friendship. 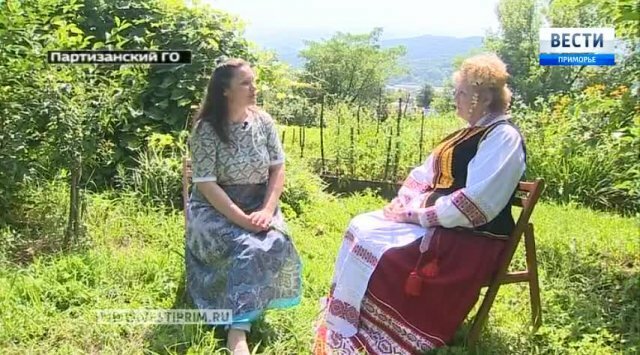 Interview "with Tatyana Rychkova, head of the" Belarus Syabry" community of the Partizansky urban district. The costume of Tatiana Rychkova was brought from Belarus. It is made by the hands of Belarusian women. They know all the rules and canons that must be present in the suit. So it is so beautiful. The "Syabry of Belarus" community was formed in Partizansk 4 years ago. The idea of creating Partizansk community was born during the Ussuriysk friendship holiday. The Belarusian community of Partizansky urban district opened a museum of national clothes and embroidery. On 25th of August Belarusians will present national cuisine and costumes on the Partizansk birthday holiday. "Syabry Belarus" from the day of its foundation gathered together in the Partizansky urban district central library. The main idea of the community is friendship and interethnic contacts with Primorye countrymen.